Mike Wiegele is one of the legends of helicopter skiing Canada. A pioneer, an innovator and one of a few industry icons, it is our pleasure to have a conversation with Mike Wiegele! 1. What made you decide to start your own Canadian heliskiing operation back in 1970? I was at the stage in my life where I was looking to be an independent business owner, to find my identity. There was an opportunity to do so at that time. 2. What was heli-skiing like when you started? It felt like such an incredible luxury that went beyond my mountaineering background. The quickness and ease of the heli felt surreal…what previously took 8-10 hours of touring, carrying our own equipment and seeing a bird’s eye view of the mountains took mere minutes. It was a completely foreign and luxurious change. 3. How many days and how much vertical have you heliskied in your career? 4. Your first operation was in Valemount. Why the move to Blue River? As great as the skiing was around Valemount, I was not satisfied. I wondered why locals kept talking about Blue River, an hour’s drive farther south. My encounter with “Grandma” Molly Nelson was one of the greatest turning points of my life. Molly Nelson, an amateur meteorologist, had kept meticulous records for the previous 34 years of the weather patterns around the Blue River region. When I read that annual snowfalls of thirty feet or more were common, my heart raced with excitement. Storms dropping three or four feet of snow at a time were a regular occurrence, and the wind patterns were far gentler than further north. I noticed how big and large the snowflakes were…no wind, more mountains and more snow…so I decided to move my operations south to Blue River in 1974. 5. When you look back at your 40 years owning Mike Wiegele Heli-Skiing, what are you most proud of? 6. How would you describe your philosophy? I try to make a difference and make things better 24 hours a day. 7. What % of your guests return the following year? We have a very loyal customer base, with a 60% returning yearly and 80% every 2 years. 8. What has changed now that your daughter Michelle is President of ‘Mike’ Wiegele Helicopter Skiing and how is it working with her? I love it…it allows me to ski more! It is good working with someone I trust so wholeheartedly, she challenges me and is not afraid to stand up to me, which is good for the operation. It is nice to have another opinion. 9. So, are you also into heli-boarding, too? No, but Michele Wiegele heliskis and heliboards! 10. The rest of the industry consists of many smaller lodges and ski chalets spread across British Columbia. Mike Wiegele Heli-Skiing is unique, with one huge operation. What are the advantages and disadvantages of your setup? We actually have both a large and small operation. In 2004 we opened the doors to our Albreda Lodge for guests that seek a more intimate boutique experience. There is definitely an advantage to having both. As far as our Blue River location, the ambience of our Heli-Village is quite magical. Despite its size, the operation carries a very intimate feel; staff outnumbers our guests and is here to ensure our guests feel very cared for. The luxury of having many helis on hand is also great – we can offer a variety of packages. It is also great for safety practices to run a larger fleet of helis. Our guests enjoy the feel of interacting with various groups and meeting other people from around the world and the festive feeling that exudes from the Resort. The amenities of our larger operation are also an added bonus, we carry a variety of powder specific equipment for our guest use that we wax and tune nightly…the wide variety also allows for our guests to try new equipment and switch things up. We have an on-site medical clinic, weather office, fitness and massage centre, saunas, whirlpool, games room, lounge, restaurant, sport shop, boutique and administration building…it is a little piece of heavenly luxury in a very remote and area. Our Albreda Lodge is beautiful and intimate for those that seek the same great service but on that smaller scale. 11. The Albreda Lodge and the (planned) Avola Lodge (exclusive 20-guest lodges “inspired by the old lodges of Europe”) are notable exceptions. Why the departure? We started noticing about 10% of our guests were going elsewhere…in search of a more boutique experience, so we opened the Albreda Lodge to cater to that clientele. Now, we have the best of both worlds. Well, this all depends on the time of year. On a typical day we average approximately 20,000 vertical feet per day – that equates to 130,000 vertical feet in a week. 12. What are the biggest challenges facing the helicopter skiing industry in British Columbia? Unregulated snowmobile activity. Snowmobiling should be governed the same as our industry – there are just too many preventable accidents occurring out there that reflect on the entire tourism industry in BC. 13. How many down days do you average? 3-5%. With such a large tenure and utilizing our 3 remote weather stations/data and 2 departing bases (Blue River and Albreda), we boast an exceptional fly rate. 14. What made you decide to add catskiing in 2007; and can guests catski on down days? There are some people that are really hesitant to try heliskiing…although completely capable. The beauty of our Cat is that it runs on semi groomed runs, allowing guests to cut in the side and down various parts where there is powder. This really helps with their confidence and most people are in the heli the second day. Our Cat is wonderful for the kids camps we host throughout the winter. Our Cat operation is not a typical backcountry situation…we run our Cat on semi-groomed runs that serve as an introductory to powder…not something most of guests would opt to do on a down day. We have exceptional cross country and snowshoeing trails (and equipment) that guests can use on a down day – but for the most part we don’t have a lot of down time and often the weather will break, allowing for the helis to fly. 15. Is there anything else you would like to add, Mike? HELISKI.com readers can buy raffle tickets for a worthy cause and a chance for a 3-day, 3-night trip for two to Mike Wiegele Helicopter Skiing Resort in Blue River BC. West Side Family Place is a small children’s based charity in Vancouver. MWHS has donated an incredible trip which they are raffling off in order to raise money. 3 days and 3 nights at the Mike Wiegele Heliski Resort in Blue River BC. The trip is for two people. All deluxe accommodations, gourmet meals,unlimited heliskiing, ski gear and guides are included. See Raffle Details below signature. Tickets are only $20. They are selling a limit of 1000. At this point, only 100 have been sold, so chances are very good! Go to WestSideFamilyPlace to buy them, or call 604-738-2819. Raffle tickets will be mailed to you. 100 percent of ticket sales go to support West Side Family Place, a community center dedicated to supporting families with children under six. They offer a safe place for kids and parents to come, meet and make friends as well as offering parenting courses. Enjoy 3 days of helicopter skiing/boarding and 3 nights accommodation for two people at Mike Wiegele Helicopter Skiing in Blue River, BC. You’ll be treated to world-class powder and terrain, luxury accommodations, gourmet meals, complimentary powder skis or snowboards, and the experience of a lifetime. Mike Wiegele Helicopter Skiing lies in the heart of the magnificent Cariboo and Monashee Mountains and is one of the world’s most productive regions for high quality, reliable powder snow. With more than 1.2 million acres and over 1,000 peaks, Mike Wiegele’s ski terrain offers world class skiing and boarding. The Heli Village Resort features 22 stunning handcrafted log chalets, Sports Shop, Guides House, and the Main Lodge which includes the dining room, lounge, fitness centre, boutique, and massage. 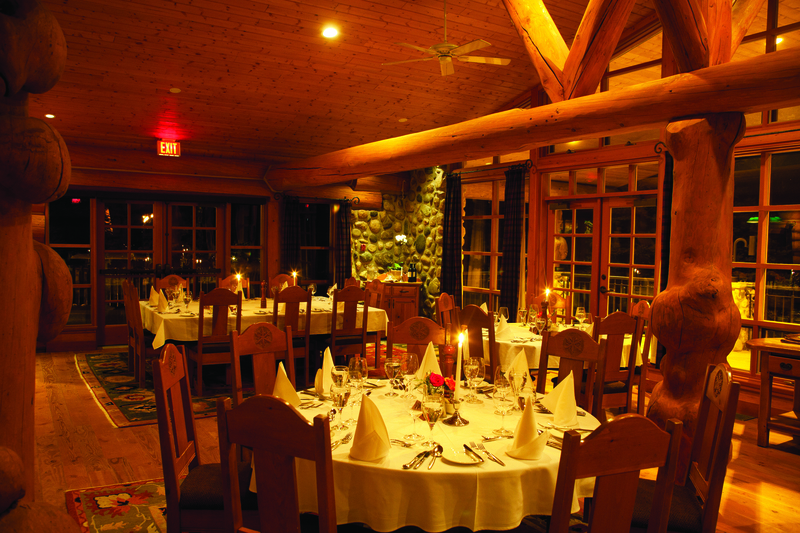 We are as well known for our cusine and amenities as we are for our skiing. Mike Wiegele Helicopter Skiing was founded in 1970 by Mike Wiegele, who acts as Chairman and still guides every week.